A new exhibition on Wittgenstein and photography is currently being shown at the Old Examination Hall in Cambridge. The world famous philosopher was a keen photographer himself, using it as a means to exemplify many of his arguments. He carried out a lot of photography when he was an architect and primary school teacher. In his writings there are numerous references to photography, demonstrating how important he saw modern media in communication. 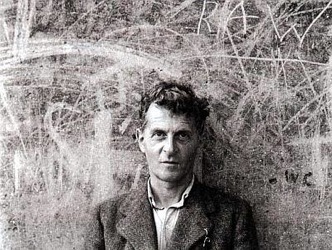 Ludwig Josef Johann Wittgenstein was born in Vienna/ Austria in 1889. He grew up in Austria-Hungary and arrived in Cambridge in 1911 to commence his studies at Trinity College. His revolutionary views on the meaninglessness of existential propositions soon challenged many of his peers. He held the professorship in philosophy at the University of Cambridge between 1939 and 1947. He wrote one of the cornerstones of modern philosophy, the Tractatus Logico-Philosophicus. This book describes the limitations of our own personal thinking directed by the limitations of language. The work contains almost no arguments, but rather declarative statements meant to be self-evident, needless to be defended. He explains the world as cases, which are defined by states of affairs and introduces the mathematical parameters of a truth function, determining any statement. The book funnels into the final statement: “Whereof one cannot speak, one must pass over in silence.” Having read the book myself, I must say it is not an easy read at all. After re-reading many pages I still only claim to merely understand some parts of it, despite being fluent in German. The book really makes one think, whether we can say we truthfully know anything at all. Wittgenstein’s personal circumstances were not easy. Not only was it difficult for an Austrian to live in Britain during war-times, but his homosexuality also made an open and truthful life difficult. How his philosophical thinking and personal circumstances influenced photography are certainly worth a look and this exhibition itself is rare and thus a must-see for anyone interested in modern philosophy. Tagged cambridge, exhibition, philosophy, photography. Bookmark the permalink. Great article! Will check this out on the weekend. Great site, determined a few something completely new! Subscribed RSS for later, aspire to see more updates like this one.